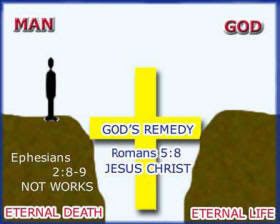 Diagrams can be very helpful for us to understand the gospel message. They are also very beneficial in helping non-Christians understand the gospel. Here is the Bridge illustration that is used widely in Chrsitian circles. It's a great idea to study the diagram in order that you may draw and present the concept to someone who does not know Christ. God desires that we experience an abundant life.This would include such things as love, peace, purpose, and fulfillment. He also desires that we experience both abundant life now and eternal life with Him. But we have a problem. God did not create us like a robot who would automatically love and have fellowship with Him in return. He gave us a will and the freedom of choice. Therefore, not only do we have the ability to make good choices, but we also have the ability to make evil choices and sin. Each of us will die physically, and after we die physically, we will face judgment. So we can see that when we look at the condition of a person apart from God, it isn’t very encouraging. 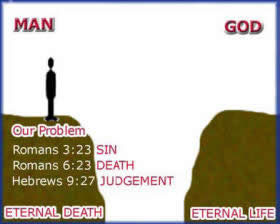 We have all sinned at one time or another, and the penalty of sin is eternal death (separation from God). Also we see that the consequences of our sin bring about the judgment of God. In spite of the fact that we have turned our backs on God and have disobeyed Him, He has provided a remedy so that we can know Him personally. 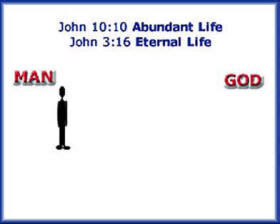 He wants to give us both abundant life and eternal life. Only one bridge can cross the gulf that exists between a person and God, and that bridge is Jesus Christ, through His death on the cross. God sacrificed His son to pay the price for all of our sins and bring us reconciliation to Him. 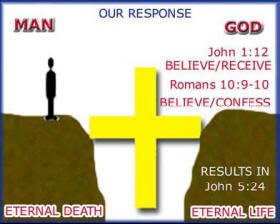 Christ has made it possible for us to cross over to God’s side and experience the full life that He wants us to have. But we are not automatically on God’s side. In order to receive the gift of Christ’s sacrifice for our salvation and cross over to God’s side, we must believe Him and trust Him. ***Adapted from The 2:7 Series: Course 2 The Growing Disciple. Colorado: NavPress, 1991.